STEVE YOUNG is regarded as one of the greatest college and pro football players of all time. 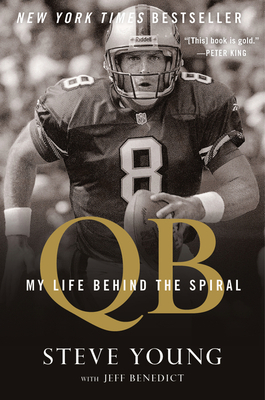 After a stellar career at Brigham Young University, the left-handed quarterback played professionally for more than fifteen years in the NFL, primarily with the San Francisco 49ers. He received numerous accolades during his playing days, including being named Most Valuable Player of Super Bowl XXIX, Sports Illustrated and Sporting News Player of the Year from 1992–1994, and the NFL's Most Valuable Player for 1992 and 1994. In 2005, Young was inducted into the Pro Football Hall of Fame. He is one of the top-rated quarterbacks in NFL history. These days, in addition to his ongoing on-air work with ESPN’s Monday Night Football and his commitment to a number of charitable endeavors, Young is a managing director and cofounder of HGGC, a private equity fund based in San Francisco. As well as his undergraduate degree, Young also holds a law degree from BYU. He lives with his wife and family in Palo Alto. JEFF BENEDICT is an author, a special features writer for Sports Illustrated, and a television and film producer. His feature stories and essays have appeared on the cover of Sports Illustrated and in the pages of the New York Times and Los Angeles Times, as well as been the basis for segments on 60 Minutes, 20/20, 48 Hours, Good Morning America, and the Discovery Channel. He is a New York Times best-selling author who has written fifteen books on topics ranging from violence against women to a deadly E. coli outbreak to the discovery of a 10,000-year-old skeleton in North America. Jeff’s most recent book—The System: The Glory and Scandal of Big-Time College Football—is being developed into a television drama by Starz. Jeff is a producer and writer for the series. Jeff is also an executive producer on the forthcoming motion picture film Little Pink House, starring Catherine Keener and Jeanne Tripplehorn. The movie is based on Jeff’s book by the same title.